FIITJEE’s Big Bang Edge Test will set you on course for extraordinary growth in terms of your ability to evaluate your potential, present capability, real inclinations & open up world class opportunities for Graduate Studies in a stream of your choice. of being with the Best Academic Team in the World. In case you are aspiring for IIT, IISc, NIT, Top Engineering College in India or aiming for success in NTSE, X / XII Boards, KVPY, Sr. Olympiads & Jr. Science Olympiad, Big Bang Edge Test can put you on path to achieving what you set out to achieve through FIITJEE’s Iconic Coaching Programs that prepare you for all Scholastic & Competitive exams relevant to your Class based on your potential, present capabilities, motivation & commitment to work hard. In case, you face a situation where opportunities in India seem beyond your reach (based on guided structured assessment by us); our sister institution, USA UnivQuest will open up opportunities outside India for you. In fact, we believe to propagate that with a catch phrase - If you can’t go to an IIT, then you go to the MIT (Massachusetts Institute of Technology, USA) ! Whenever faced with obstacles in life, it is important to analyse & evolve an alternate strategy to beat the competition (including your peer group). 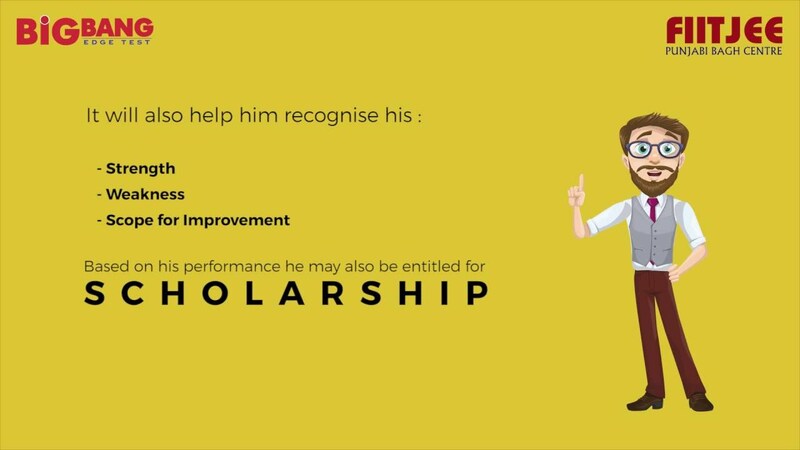 As you are aware, every FIITJEE Test is also a Scholarship Test. Therefore, based on your potential & present capabilities as demonstrated in our Test, we will give you Fee Waivers as a support to recognize the genius in you. FIITJEE’s recognition of the genius, the commitment, and motivation in you goes much beyond giving you Fee Waivers for a course at FIITJEE. FIITJEE gives astronomical sums as Cash Rewards to its Students for registering notable success in JEE Advanced, JEE Main, Olympiads, KVPY, XII Board, NTSE & Jr. Olympiads. For details, visit the nearest FIITJEE Centre & ask for the Reward Booklet. These Rewards are enabling Students to support their Parents financially even when they are studying in IITs. What’s more, FIITJEE also provides enough seed capital for startup ventures of these Students.